Subterranean termites are devastating insects that can cause costly damage to your home or business. 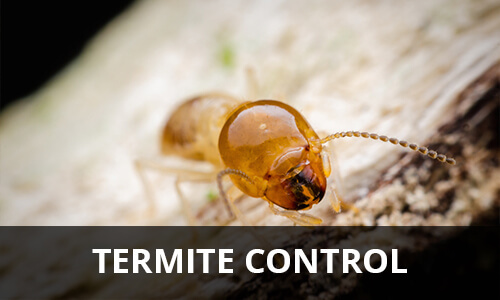 A termite colony can number in the millions and work undetected 24/7. That is why we use the number one brand in termite protection, The Sentricon System. The Sentricon System works to eliminate the entire colony, not just individual termites. Stations are placed around your home or office building, which is much less invasive than drilling or digging and even more effective. In addition to its effectiveness, Sentricon is environmentally friendly by using Recruit termite bait. Recruit mimics the biology and behavior to spread and destroy the colony. This premier bait is the first registered by the U.S. Environmental Protection Agency under the Reduced Risk Pesticide Initiative. Thorough property inspection for termites and termite colonies. Sentricon stations with Recruit bait are placed in the soil around your home or business. Recruit bait works to protect against termites. Technician rechecks stations to protect against future infestations.